Iron is an important nutrient for our body and for our health. Iron (haeme) works with Protein (globin) to make “haemoglobin’ in red blood cells. The haemoglobin carries oxygen to all parts of the body so it can perform its normal functions. Iron is also a part of ‘myoglobin’, a protein that helps muscle cells store oxygen. Without enough iron, the body’s fuel cannot be properly synthesized. Thus it’s easy to notice why iron is so vital for life and especially for breakfast which is the first day of meal after around 8 hours of fast. While this section consists of greens like Spinach in Sprouts Dhokla, Halim in Halim Drink with lime, Cauliflower Greens in Cauliflower Greens and Besan Muthia; other source of iron like Poha, Beaten Rice, Ragi, nuts, sprouts, Dal and Jowar find place in this section too. 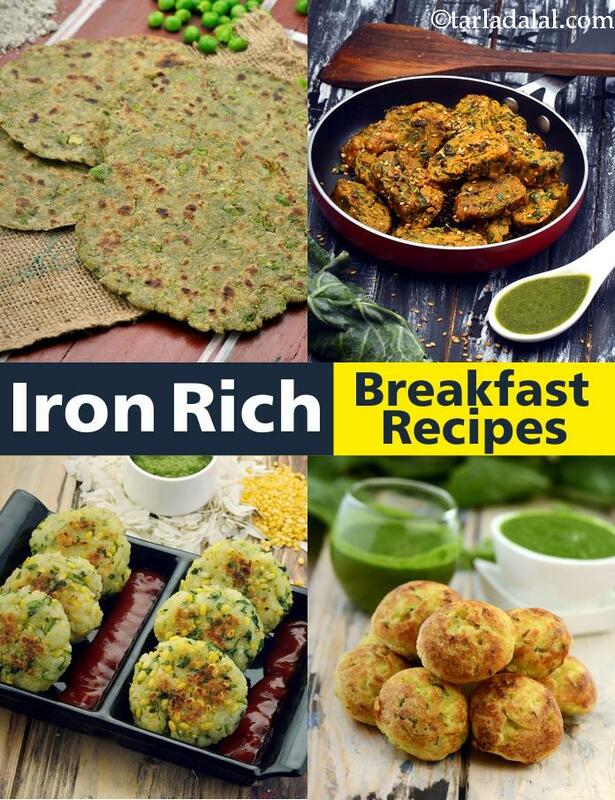 Mini Nachni and Bajra Khakhra, Moong Sprouts Pesarattu, Muesli with Nuts and Poha Cutlet and few such examples of Iron rich foods. Don't forget to have your Iron Rich Juices if you are short on time to make breakfast. Pump in your iron levels with these wholesome recipes as the first meal of your day and bubble with energy all day long!